Note: You can find previous installments of this series by clicking here, Introduction, Part 1, Part 2, Part 3, Part 4. Last time, I finished up the construction of the saw. Now all that’s left to do is to file in the teeth. Commercial saw manufacturers punch the teeth in with a machine, resulting in perfectly spaced teeth. I don’t have this equipment, nor do I wish to invest in it, so I use a file. Honestly, the process really isn’t that hard to do, and I think teeth that are hand filed end up feeling a little smoother in the cut compared to perfectly spaced teeth anyway. The hand filing process introduces very minor variation in tooth spacing. This random spacing, theoretically, reduces harmonic chatter, even if only slightly. I don’t know how much difference it really makes, but I’ve been using hand filed saws for at least 15 years, and I think it makes a difference. Using some kind of pattern helps to keep the tooth spacing as even as possible by hand. To set the tooth spacing, you have two choices. If you are really good, you can do it by eye. But honestly, I wouldn’t recommend it. No matter how good your eye is, trying to go about the process unguided is really nothing more than a parlor trick. Maybe you can get pretty close, but you could probably do better with a little help. Which brings us to the second choice – some kind of pattern. 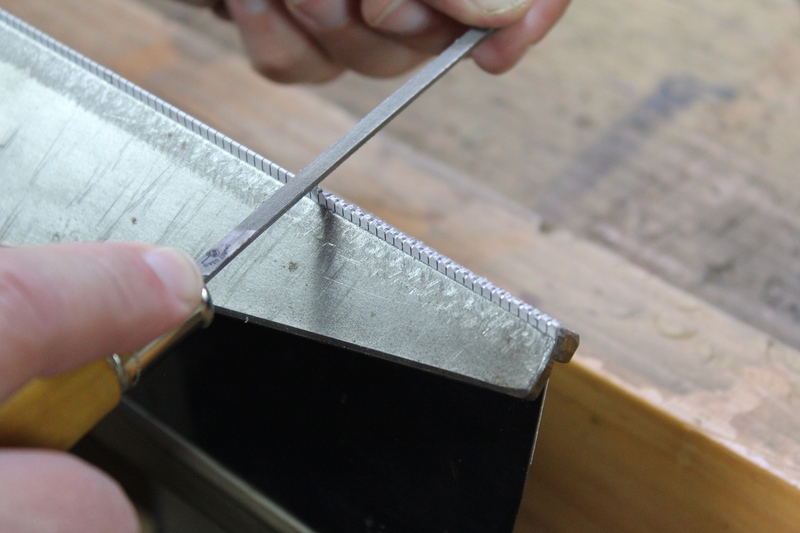 I’ve seen all kinds of recommendations for tooth spacing patterns, from using a hacksaw blade, to all-thread, to measuring, marking and chiseling lines in a piece of wood. Honestly, I’m sure all of these methods work just fine, even if they are somewhat overly complicated. Personally, I’ve never found any pattern easier or faster to use than some lines printed on a piece of paper. I used to use a CAD program create my own patterns. Now, several folks have made them and put them on the web free for everyone to use. So I just went over to Blackburn Tools and printed out a pattern for 13 PPI. The pattern is large enough that you can cut it into multiple pieces for saws that are longer than the sheet of paper. So that’s what I did. I cut the pattern into two strips. Then, I sprayed some adhesive onto the back sides of the two strips of paper. After giving the adhesive about a minute to start to tack up, I applied the patterns to the saw blade, folding them over the toothline. I trim the pattern right on one of the lines so that the edge of the paper strip can be aligned right to the edge of the saw blade. If you need to overlap two or more strips, just match up the lines for a perfect continuous pattern. Letting the spray adhesive set up for a minute or so before applying makes it easier to remove the pattern and excess adhesive later. I use the smallest file I have and cut the new teeth right through the paper pattern. If you really want to, you can try to align the patten with the edge of the toothline. But this really isn’t necessary at all. I just fold the pattern right over the edge so that the lines are right on top of the edge. This makes it very easy to figure out where to put your file. Speaking of files, no matter what size teeth I’m making, when I’m in this initial phase of filing in new teeth, I choose the smallest file with the sharpest corner that I have. This typically means the file I use to sharpen dovetail saws. The sharper the corner, the easier it will be to accurately place the gullets of the new teeth. To start the process, I make only one or two strokes right on each line of the pattern. 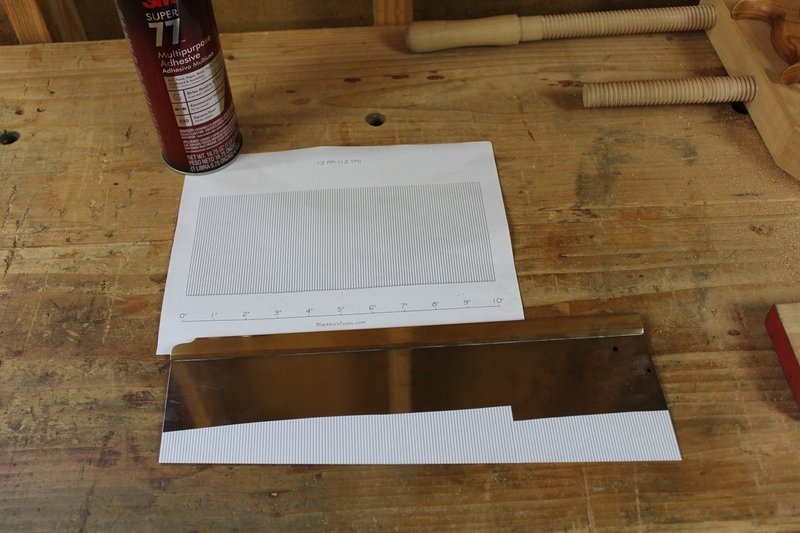 The tiny little file will cut right through the paper pattern and put a notch where the new gullet will be. I also do not worry about any rake or fleam angle at this point. In fact, I hold the file so that one face is perfectly parallel to the floor. This ensures that the file will cut straight down and will not be inclined to drift toward the toe or heel. The goal at this point is just to transfer the location of the gullets from the paper pattern to the saw blade. So one to two strokes of the file will be all that is needed. I work all the way up the saw, filing a notch at each line on the pattern. Once I’ve filed a notch at each gullet location, I remove the paper with a razor blade and some solvent to remove the adhesive that’s left behind. Once the gullet locations are all established, then I can establish the teeth at the proper rake angle. 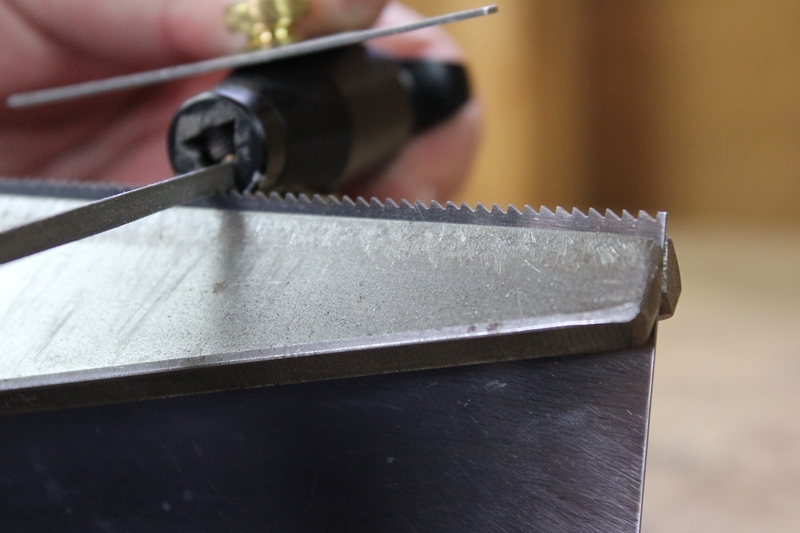 After removing the paper and the adhesive, the blade goes back into the saw vise to have the teeth refined. Now, I will put my rake angle guide onto the file in order to establish a consistent rake angle on each tooth. Again, I will make just two or three strokes at each gullet. I will not sink the teeth to full depth on the first pass. It will take me at least two passes up the saw to do so, and on saws with larger teeth, it might take three or even four passes. The reason for sinking the teeth gradually is to maintain, to the best of your ability, the more or less even spacing that you started by using the pattern. By sinking the teeth in multiple passes, you can watch the flats at the top of each tooth and the depth of the gullets as you progress and make adjustments as you go to keep things as evenly spaced as possible. If you try to sink the teeth to full depth all at once, you could end up with a mess on your hands by the time you get from one end of the saw to the other. You can see in the photo above that these teeth still have small flats remaining. This picture was taken during the first pass up the saw. This particular saw I did in two passes. I like to set the teeth before I file any fleam. Once all of the teeth have been filed to depth and the flats are all gone, I set the teeth. I begin at the heel of the saw and work toward the toe setting every other tooth. I don’t set all the way to the heel or all the way to the toe. The saw set wants to drop off the blade if you try to set all the way to the ends. The teeth at the ends really don’t need to be set anyway if all of the teeth in the middle are set. So I start setting the saw at the point where the saw set is fully bearing on the teeth. This is about 3/4″ to 1″ from the end of the saw. I’m just trying to set the top 1/3 or so of each tooth, not the entire tooth. If you try to set the entire tooth, you might break them off. If you’re using a saw set like mine, as long as you have it dialed to the correct number of PPI, you’ll be setting the teeth at the correct height on the tooth. The goal is to set every other tooth, working my way up the saw. Then I flip the saw around in the vise and set the remaining teeth so that each tooth is alternately set when I’m done. If you make a mistake and set two teeth in a row in the same direction, don’t worry about it. It won’t affect the performance of the saw and it can always be fixed at a future sharpening. Do not try to set a tooth in the opposite direction of it’s original set or you run the risk of breaking the tooth off. If you’re making a crosscut saw, all that’s left to do is file the fleam. If you’re making a rip saw, you’re pretty much done after setting the teeth. 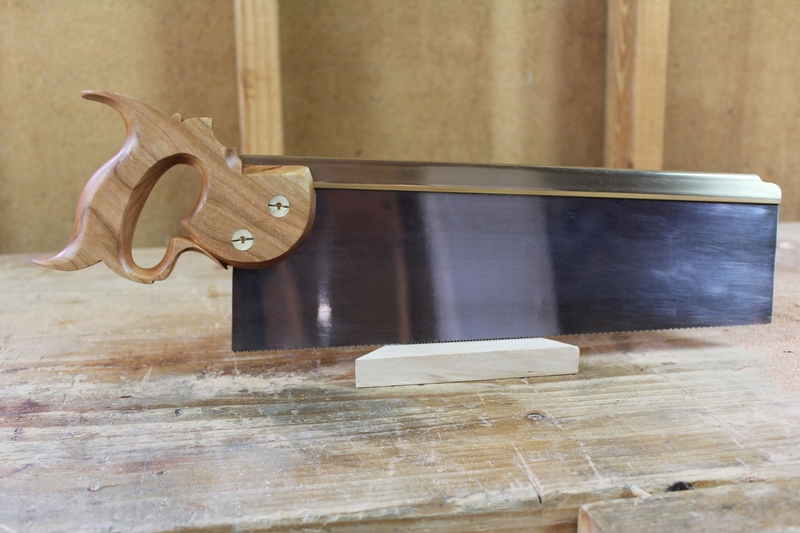 But if you’re making a crosscut saw, like I am here, there’s one more step to go – filing the fleam. The fleam, like the set, alternates teeth. In a properly filed crosscut saw, the bevels should be filed on the sides of the teeth that face toward the center of the toothline. I begin by filing about 25 degrees of fleam on the front edge of the teeth that are set away from me, by angling the file toward the toe. Once I have filed every other tooth in this way, I file the fleam on the front edge of the teeth that are set toward me by angling the file toward the heel. I do not turn the saw around, rather I file all of the fleam from the same side of the saw. This is what works for me, but if you prefer to turn the saw around half way through the process, I won’t talk you out of it. 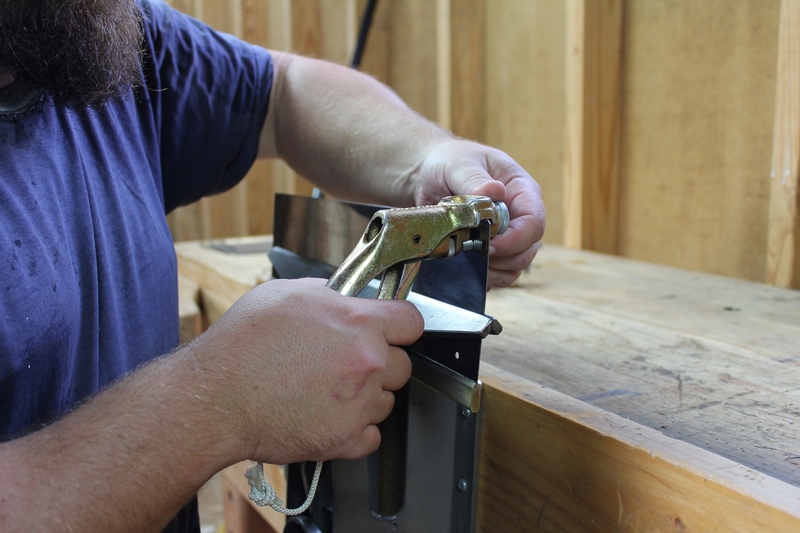 Once the fleam is filed, I perform one final step prior to using the saw. I like to VERY lightly joint the sides of the teeth to even out the set. 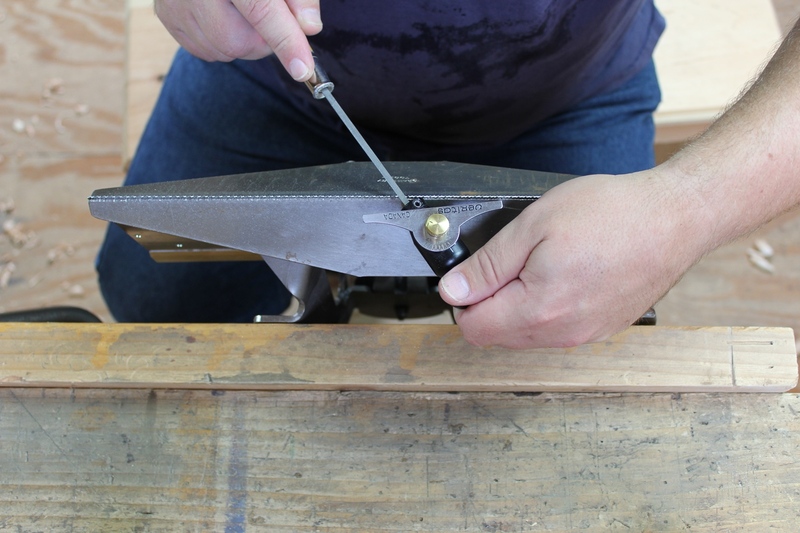 To do this, I place the saw blade flat on the edge of my bench and with a dull mill file, I make one pass using just the pressure of the weight of the file, from heel to toe, keeping the file flat to the side of the saw plate. I then flip the saw over and lightly joint the other side the same way, making only one light pass from heel to toe. The finished saw, ready for delivery to its new owner. Once I’ve done the side jointing, the saw is basically ready for use. I did a little final polishing of the blade and back with some metal polish on a rag, just to remove most of the smudges and finger prints. This is really not a necessary step, but since this saw was made for sale and not for me, I took the extra time to clean it up just a bit. So I hope you’ve enjoyed this series and that, just maybe, I have given you some encouragement to try your hand at making a saw for yourself. With a little patience, you can make a saw that looks and performs just as well as any commercially available saw. I’ve got three more saws to finish up, but this one is ready to go home with its new owner. Oh, and if you’re looking for a video on this process, I did one back in 2012. You can watch it below if you’re so inclined. Posted in Hand Saws, Sharpening, Toolmaking and tagged sash saw, tenon saw. I was thinking at the end this might be a class you can offer. Students bring in a couple of saws (all the same or all different) and start from the beginning cleaning up the saw plate, tote and then sharpening. Definitely a class I would take as I have several saws that need sharpening and the practice would be very beneficial. Not that all saws would be processed but one might be better than the others and that saw would be the one to have the student proceed with. Good teaching tools using the others to discuss the reason for not choosing them. Thanks! I used to teach this class at the Woodcraft in Wilmington, DE. Well, not the full restoration, but the sharpening part. I always had at least 3-4 students. I did a saw sharpening seminar down here back in March I think. It had pretty good attendance. But it was a free seminar. I did suggest a hand saw sharpening class to the school but they were kind of iffy about it. Apparently they have tried to offer sharpening classes before but they didn’t do too well. But maybe I’ll try again in the spring. Restoring a single saw could easily be a one day class. Would be a good one for a Saturday. I just need to get my hands on a few spare saw filing vises. I cobbled some together for my Woodcraft classes, but they weren’t the greatest. I’d like to have something a bit more substantial as a good vise makes the process much less frustrating. Unfortunately I cannot afford to supply the entire class with Gramercy vises 🙂 . The advice about not setting the very front and back teeth is great. It makes perfect sense, but it’s not something I really ever considered for some reason. Definitely doing that from now on. Yeah, I used to try to set all the teeth. But the more saws I sharpened, the more I realized it just wasn’t necessary. Most people don’t even use the teeth at the last inch on either end. It may be even better to just not cut teeth on the front or back. I just bought one of Kevin Glen-Drake’s joinery saws with no teeth on the first and last 2 inches, because I though it would be easier for 10 year daughter to use. After getting it, it is my favorite joinery saw. Not only could my daughter use it much easier than my Japanese and LN saws, I find it easier as well. The only problem with not cutting teeth at the toe and heel of the saw is that with continued sharpening you will lower the teeth well below the flat spot at the front and back unless you joint every single time you sharpen your saws (I don’t). As long as you file down the untoothed areas you’ll be fine. But if you don’t it will cause problems in the future. Personally, I use the teeth at the front and back of my saws, so I wouldn’t be without them. Possibly even a plane restoration/sharpening class, or just sharpening plane irons & chisels. For some reason sharpening appears to baffle a lot of people and intimidating as well. You could possibly post directions for building a saw vise and the students could bring their own, or make that a class along with bench appliances. I’m doing my best to attend a class of yours as long as I can work my schedule around attending. All good ideas in my mind. Will have to see what the school’s coordinator thinks. Thanks for the tip about putting the paper on the plate it worked great for me today! I purchased an old 18″ Disston D-8 panel saw a few years ago off ebay and cleaned the saw plate, but the teeth were so badly mangled that there was no way I could properly sharpen it. I first tried to recut teeth using the wooden guide and hacksaw method that Paul Sellers demonstrated. This was extremely time consuming and I could not find a hacksaw blade that could take more than a few swipes without dulling or breaking teeth. I was about to have the saw recut for $12 here in Houston at Circle Saw when I saw your blog and video. I really thought it would be hard to file the teeth, but after taping on the guide from blackburn tools and then realizing that I needed a light first pass with the file, it was really easy and very fast. I messed up on 3 or so, but I’m hoping to fix those as I continue to file. But overall, I was really shocked at just how easy this was using your method.
? Glad it was able to be of help! Thanks for your sharing! It wasn’t easy to find simple and accurate teaching about filing new teeth! You did it! !